The stock market has been gorging on gains over the last six years and the big question is are we ready for a crash diet? In other words, have we consumed too much, too fast? Since the lows of 2009 the S&P 500 index has more than tripled (or +209% without dividends). 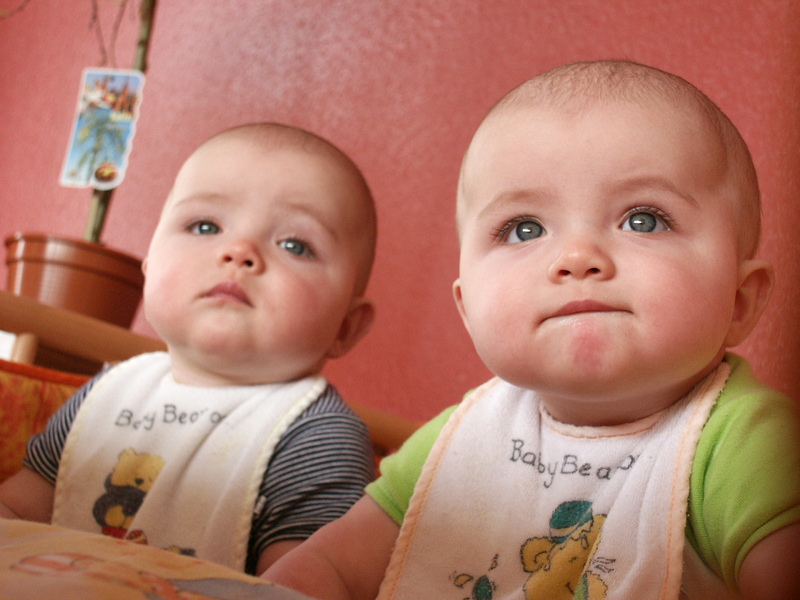 In our daily food diets our proteins of choice are primarily chicken and beef. When it comes to finances, our investment choices are primarily stocks and bonds. There are many factors that can play into a meat-eaters purchase decision, including the all-important factor of price. When the price of beef spikes, guess what? 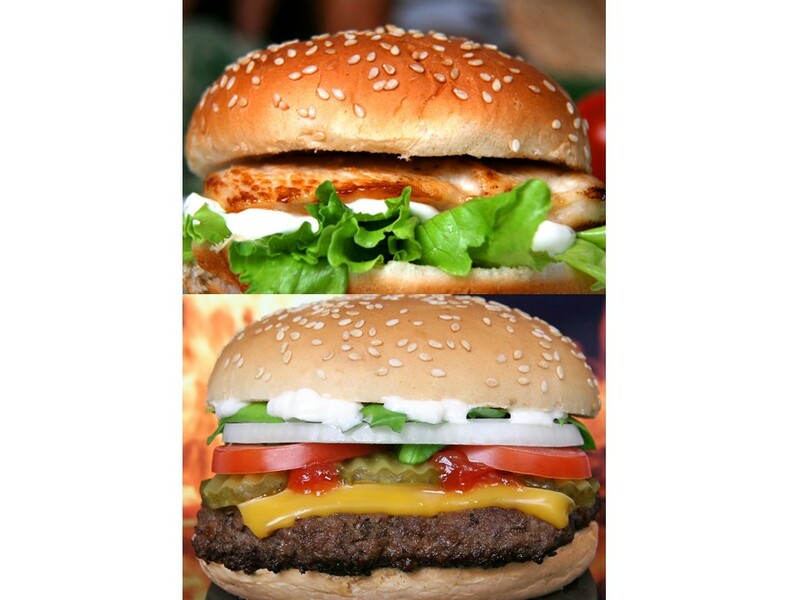 Consumers rationally vote with their wallets and start substituting beef for relatively lower priced chicken options. The same principle applies to stocks and bonds. And right now, the price of bonds in general have gone through the roof. In fact bond prices are so high, in Europe we are seeing more than $2 trillion in negative yielding sovereign bonds getting sucked up by investors. Another area where we see evidence of pricey bonds can be found in the value of current equity risk premiums. Scott Grannis of Calafia Beach Pundit posted a great 50-year history of this metric (chart below), which shows the premium paid to stockholders over bondholders is near the highest levels last seen during the Great Recession and the early 1980s. To clarify, the equity risk premium is defined as the roughly 5.5% yield currently earned on stocks (i.e., inverse of the approx. 18x P/E ratio) minus the 2.0% yield earned on 10-Year Treasury Notes. 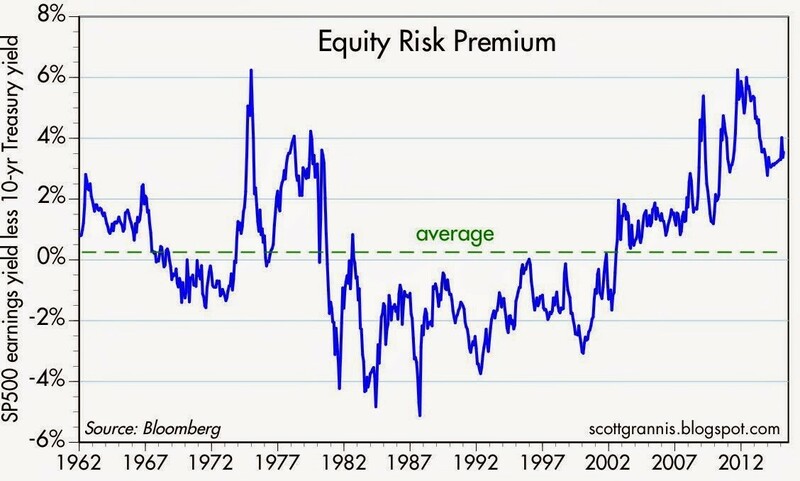 The equity risk premium even looks more favorable if you consider the negative interest rate European environment mentioned earlier. The 60 billion euros of monthly debt in ECB (European Central Bank) quantitative easing purchases has accelerated the percentage of negative yield bond issuance, as you can see from the chart below. 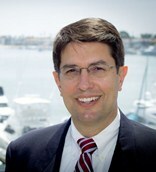 Dr. Ed Yardeni coined the famous phrase “bond vigilantes” to describe the group of hedge funds and institutional investors who act as the bond market sheriffs, ready to discipline any over leveraged debt-issuing entity by deliberately cratering prices via bond sales. For now, the bond vigilantes have in large part been hibernating. As long as the vigilantes remain asleep at the switch, stock investors will likely continue earning these outsized premiums. How long will these fat equity premiums and gains stick around? A simple diet of sharp interest rate increases or P/E expansion would do the trick. An increase in the P/E ratio could come in one of two ways: 1) sustained stock price appreciation at a rate faster than earnings growth; or 2) a sharp earnings decline caused by a recessionary environment. On the bright side for the bulls, there are no imminent signs of interest rate spikes or recessions. If anything, dovish commentary coming from Fed Chairwoman Janet Yellen and the FOMC would indicate the economy remains in solid recovery mode. What’s more, a return to normalized monetary policy will likely involve a very gradual increase in interest rates – not a piercing rise as feared by many. 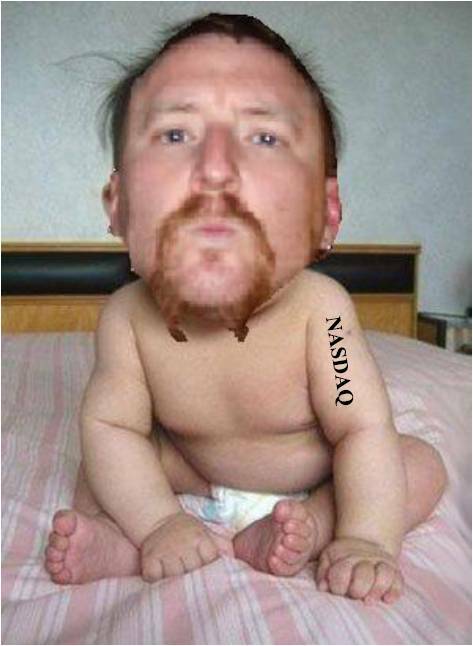 Regardless of whether it’s beef prices or bond prices spiking, rather than going on a crash diet, prudently allocating your money to the best relative value will serve your portfolio and stomach best over the long run. I will be the first one to admit I hate needles. In fact, I’ve been known to skip my annual flu shots out of cowardice simply to avoid the harmless prick of the syringe. 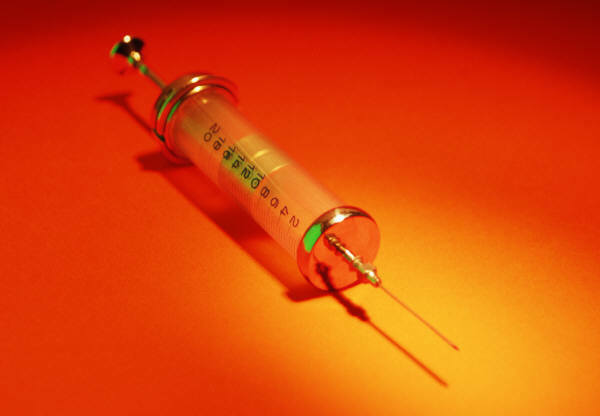 The mere thought of a long needle jabbing into my arm, or other fleshy part of my body, has had the chilling effect of generating irrational decisions (i.e., I forgo flu shot benefits for no logical reason). For months the talking heads and so-called pundits have speculated and fretted over the potential removal of the term “patient” from the periodically issued Federal Open Market Committee (FOMC) statement. Since the end of 2014, the statement read that the Fed “can be patient in beginning to normalize” monetary policy. Which brings us back to the Fed’s removal of the word “patient”. Upon release of the statement, the Dow Jones Industrial index skyrocketed about 400 points in 30 minutes. Considering the overwhelming consensus was for the Fed to remove the word “patient”, and given the following favorable factors, should anyone really be surprised that the market is trading near record highs? While the short-term relief rally may feel good for the bulls, there are still some flies in the ointment, including a strong U.S. dollar hurting trade, an inconsistent housing recovery, and a slowing Chinese economy, among other factors. 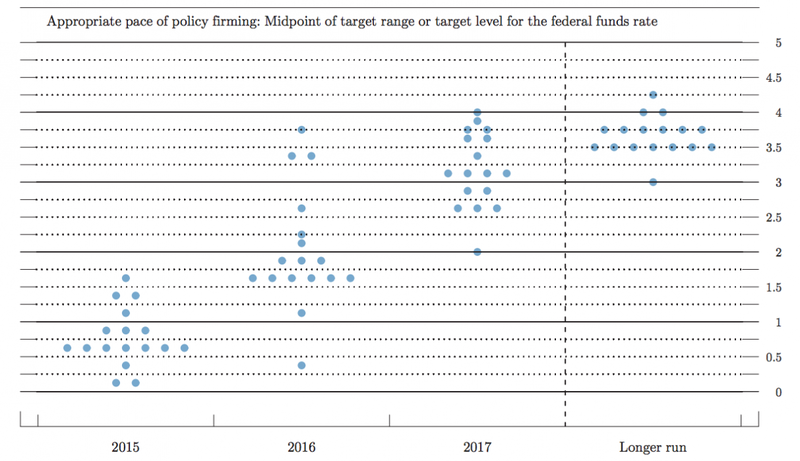 Outside the scandalous “patient” semantics was the heated debate over the Fed’s “Dot Plot,” which is just a 3rd grader’s version of showing the Fed members’ Federal Funds rate forecasts. While to a layman the chart below may look like an elementary school dot-to-dot worksheet, in reality it is a good synopsis of interest rate expectations. Part of the reason stocks reacted so positively to the Fed’s statement is because the “Dot Plot” median interest rate expectations of 0.625% came down 0.50% for 2015, and by more than 0.60% for 2016 to 1.875%. This just hammers home the idea that there are currently no dark clouds looming on the horizon that would indicate aggressive rate hikes are coming. These sub-2% interest rate expectations over the next few years hardly qualify as a “hawkish” stance. As I’ve written before, the stock market handled a 2.5% hike in stride when the Fed Funds rate increased in 1994 (see also 1994 Bond Repeat or Stock Defeat?). What’s more, the Fed Funds rate cycle peaked at 5.0% in 2007 before the market crashed in the Great Recession of 2008-2009. Although volatility is bound to increase as the Federal Reserve transitions out of a six-year 0% interest rate policy, don’t let the irrational fear of a modest Fed hike prick scare you away from potential investment benefits. March Madness has arrived once again. This NCAA basketball event, which has been around since 1939, begins with a selection committee choosing the top 68 teams in the country. These teams are matched up against each other through a single-elimination tournament until a national champion is throned. The stock market does not have a selection committee that picks teams from conferences like the SEC, Big East, Pac-12, and ACC, but rather millions of investors select the best investments from asset classes like stocks, bonds, real estate, commodities, venture capital, and private equity. In the investment world, there are no win-loss records, but rather there are risk-return profiles. Investors generally migrate towards the asset classes where they find the optimal trade-off between risk and return. Speculators, day-traders, and momentum traders may define risk differently, but regardless, over the long-run, capital goes where it is treated best. And over the last six years, the U.S. stock market hasn’t been a bad place to be (the S&P 500 has about tripled). Why such outperformance in stocks? Besides a dynamic earnings recovery from the 2008-2009 financial crisis, another major factor has been the near-0% interest rate environment. When investors are earning near nothing in their bank and savings accounts, it is perfectly rational for savers to look for riskier options, if they are compensated for that risk. In addition to loose central bank and quantitative easing policies fueling demand for stocks, rising dividends have increased the attractiveness of the stock market. In fact, as you can see from the chart below, dividends have about doubled from 2008-2009 and about tripled from the year 2000. 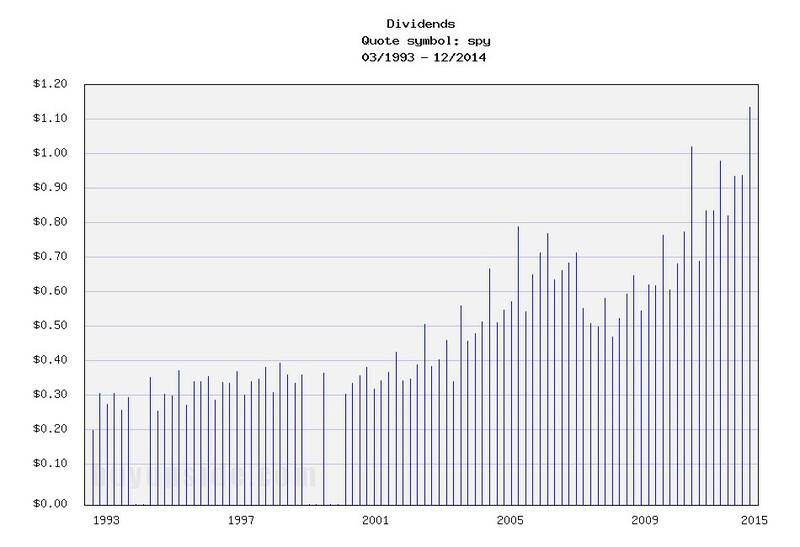 Stock prices have moved higher in concert with rising dividends, which, as you can see from the chart below, has kept the dividend yield flat at around 2% over the last few years. Treasury bond yields, on the other hand, have been on steady declining trend for the last 35 years. So, while coupons on newly issued bonds have been declining for virtually the last three and a half decades, stock dividends have been on a steadily upward moving rampage, excluding recessions (up +13% in the most recent reported period). Declining interest rates have made stocks look attractive relative to investment grade corporate bonds too as evidenced by the chart below. 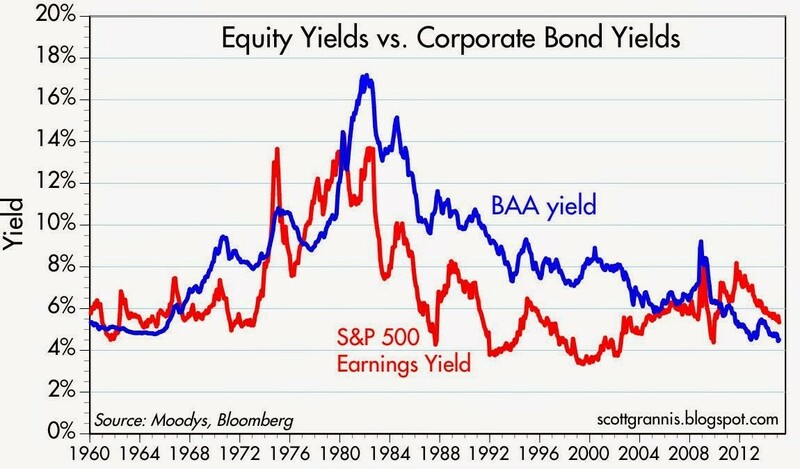 As you can see, over the last half-century, corporate bond yields have predominantly offered higher income yields than the earnings yield on stocks – that is not the case today. 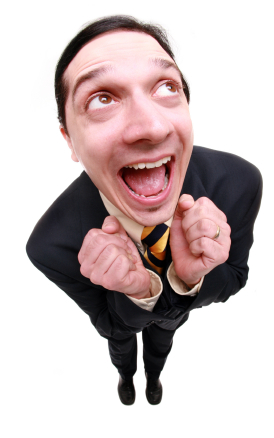 What does all this stock dividend, earnings yield stuff mean? In the grand scheme of things, income starving Baby Boomers and retirees are slowly realizing that stocks in general stack up favorably in an environment in which interest payments are going down and dividend payments are going up. One of the areas highlighting the underlying demand for stocks is the Volatility Index (VIX) – a.k.a., the “Fear Gauge.” Despite Greece, Russia, ISIS, the Fed, and the Dollar dominating the headlines, the hunger for yield and growth in a declining interest rate environment is cushioning the blow during these heightened periods of volatility (see also A Series of Unfortunate Events). Since the end of 2011, the monthly close of the VIX has stayed above its historical average of approximately 20 only two times (see chart below). 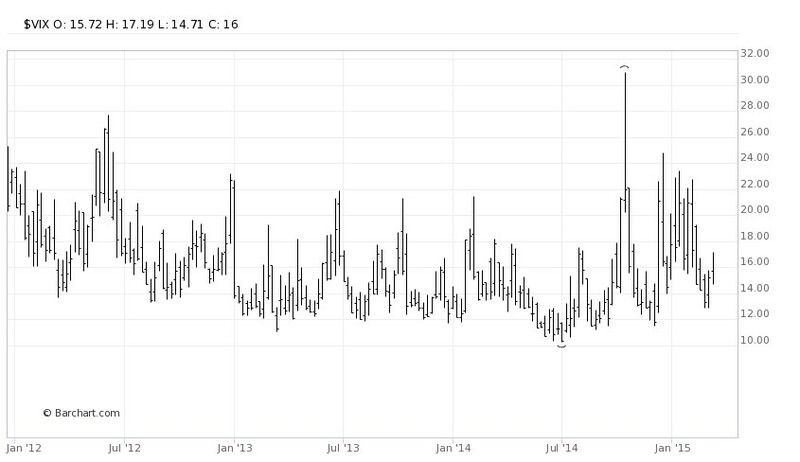 In other words, over that timeframe, the VIX has remained below average about 95% of the time. When the VIX has spiked above 20, generally it has only been for brief periods, until cooler heads prevail and bargain hunters come in to buy depressed stock bargains. I’m not naïve enough to believe the bull market in stocks will last forever, but as long as interest rates don’t spike up and/or corporate earnings crater, underlying demand for yield should provide a floor for stocks during heightened periods of volatility. 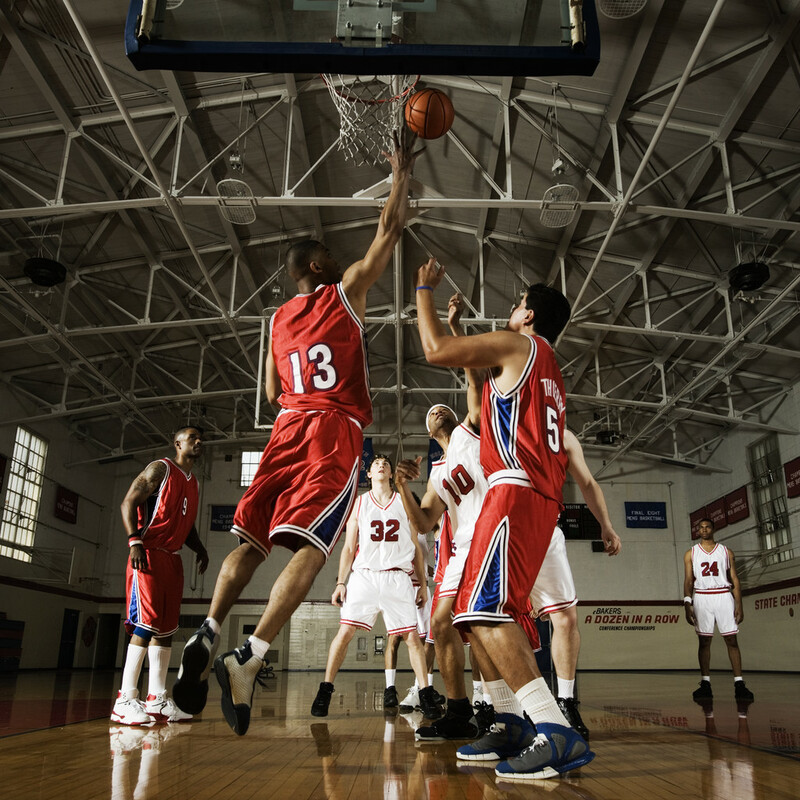 We may be in the midst of March Madness but volatility blandness is showing us that investors are paying attention to dividend grandness. 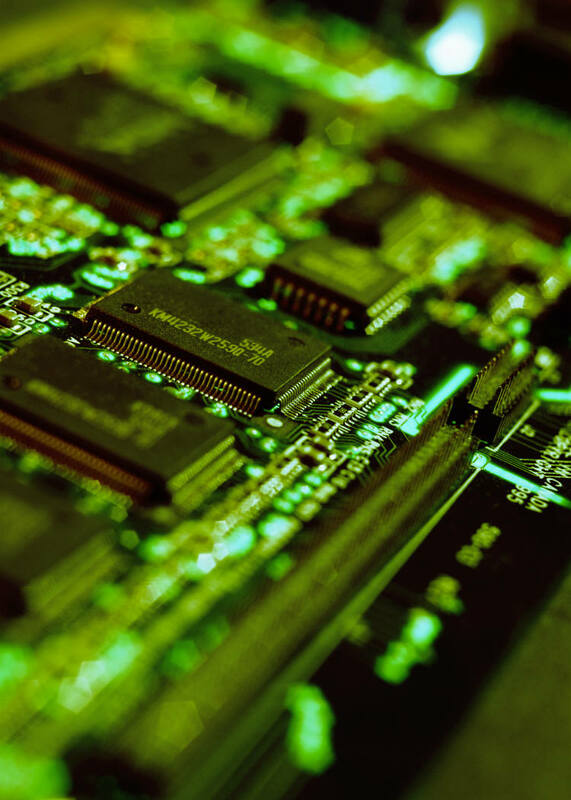 DISCLOSURE: Sidoxia Capital Management (SCM) and some of its clients hold positions in certain exchange traded funds (ETFs) and SPY, but at the time of publishing, SCM had no direct position in any other security referenced in this article. No information accessed through the Investing Caffeine (IC) website constitutes investment, financial, legal, tax or other advice nor is to be relied on in making an investment or other decision. Please read disclosure language on IC Contact page. This article is an excerpt from a previously released Sidoxia Capital Management complementary newsletter (March 1, 2015). Subscribe on the right side of the page for the complete text. Considering the following current event headlines, who would have guessed the stock market is trading near record, all-time highs and the NASDAQ index breaking 5,000 for the first time since the year 2000? After reading all these depressing stories, I feel more like taking a Prozac pill than I do venturing into the investing world. Unfortunately, in the media world, the overarching motto driving the selection of published stories is, “If it bleeds, it leads!” Plainly and simply, bad news sells. The media outlets prey on our human behavioral shortcomings. Specifically, people feel the pain from losses at a rate more than double the feelings of pleasure (see Controlling the Lizard Brain and chart below). This phenomenon leaves Americans and the overall investing public choking on the daily doom and gloom headlines. Investor skepticism caused by the 2008-2009 financial crisis is evidenced by historically low stock ownership statistics and stagnant equity purchase flow data. 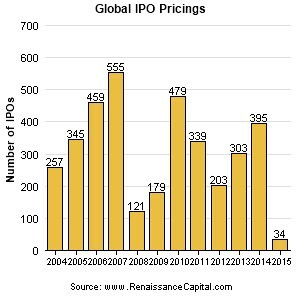 Talk of another stock bubble has been introduced again now that the NASDAQ is approaching 5,000 again, but we are not seeing signs of this phenomenon in the IPO market (Initial Public Offering) – see chart below. IPOs are on the rise, but the number of filings is more than -50% below the peak of 845 IPOs seen in the late 1990s when former Federal Reserve Chairman Alan Greenspan made his famous “irrational exuberance” speech (see also Irrational Exuberance Deja Vu and chart below). 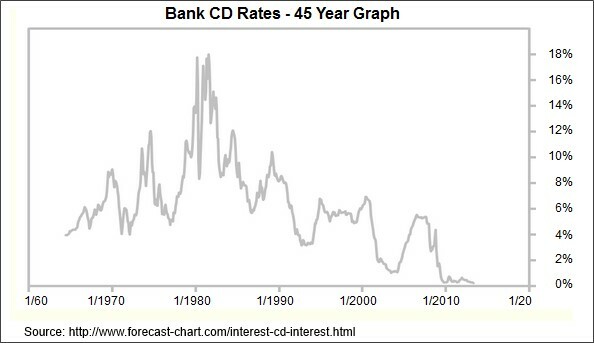 Compounding the never-ending pessimism problem is the near-0% interest rate environment. Times are long gone when you could earn 18% on a certificate of deposit (see chart below). Today, you can earn 0.08% on a minimum $10,000 investment in a Bank of America (BAC) Certificate of Deposit (CD). Invest at that rate for more than a decade and you will have almost accumulated a $100 (~1%) – probably enough for a single family meal…without tip. To put these paltry interest rates into perspective, the U.S. stock market as measured by the S&P 500 index was up a whopping +5.5% last month and the Dow Jones Industrials climbed +5.6% (+968 points to 18,133). Granted, last month’s S&P 500 percentage increase was the largest advance since 2011, but if I wanted to earn an equivalent +5.5% return by investing in that Bank of America CD, it would take me to age 100 years old before I earned that much! Globally, the interest rate picture doesn’t look much prettier. In fact, the negative interest rate bonds offered in Switzerland and other neighboring countries, including France and Germany, have left investors in these bonds with guaranteed losses, if held to maturity (see also Draghi Beer Goggles). 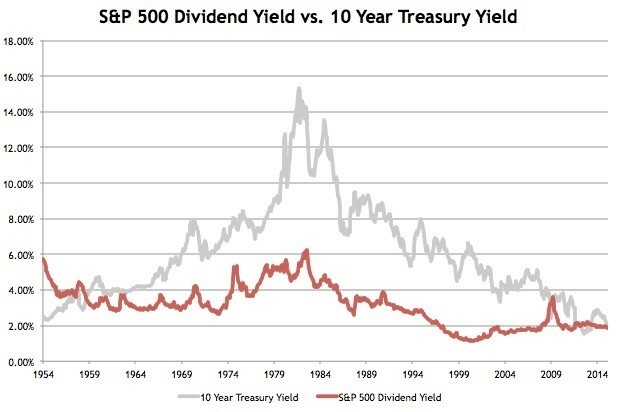 Investors and followers of mine have heard me repeatedly declare that “money goes where it is treated best.” When many investments are offering 0% (or negative yields), it comes as no surprise to me that dividend paying stocks have handily outperformed the overall bond market in recent years. Hard to blame someone investing in certain stocks offering between 2-6% in dividends when the alternative is offered at or near 0%. While at Sidoxia we are still finding plenty of opportunities in the equity markets, I want to extend the reminder that not everyone can (or should) increase their equity allocation because of personal time horizon and risk tolerance constraints. Regardless, the current, restricting global financial markets are highlighting the scarcity of investment alternatives available. 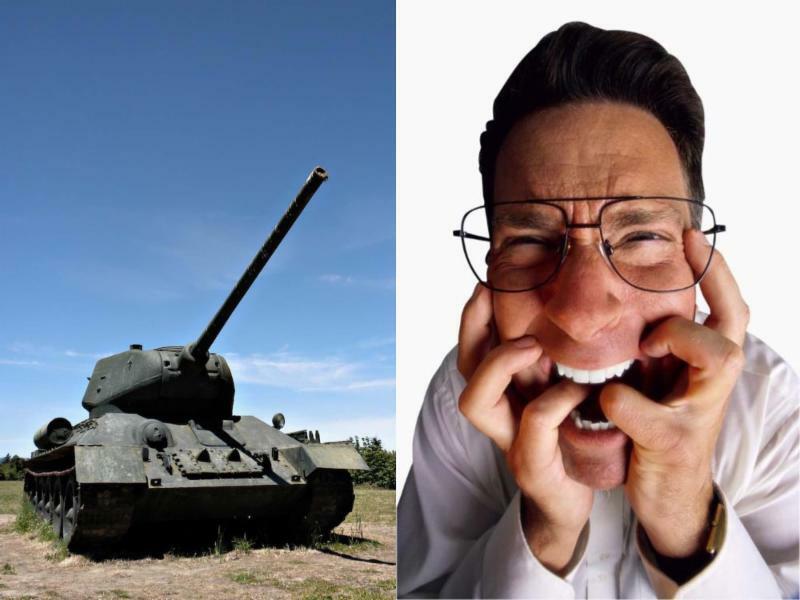 As we will continue to be bombarded with more cease fires, quagmires and other bleeding headlines, investors will be better served by ignoring the irrelevant headlines and instead create a long-term financial plan with an asset allocation designed to meeting their personal goals. By following this strategy, you can let the dooms-dayers bleed while you succeed. DISCLOSURE: Sidoxia Capital Management (SCM) and some of its clients hold positions in certain exchange traded funds (ETFs) and BAC, but at the time of publishing, SCM had no direct position in any other security referenced in this article. No information accessed through the Investing Caffeine (IC) website constitutes investment, financial, legal, tax or other advice nor is to be relied on in making an investment or other decision. Please read disclosure language on IC Contact page.